If you've chosen the ghillie route in life then thank your lucky stars you can spend your days in such beautiful natural surroundings and in such an amazingly natural pursuit. There's huge 'life value' in turning up on a salmon river each day. The Spring run is running a bit late this year or the big floods washed out all the spawning redds a few Winters ago or our salmon have been commercially stolen or decimated by mackerel shoals at sea! What's new if you really sit back and analyse the 'highs & lows' (and 'smokescreens') of Scottish salmon fishing. With zero oceanic security and no annual wild smolt output targets or even effective fish counters to know our 'in river' salmon stock positions isn't it amazing that salmon are still there to be caught at all. If you've trained your head to react to the 'catch stats' like a goldfish waiting for its feed pellets to be thrown then it's best you reset your focal point as negativity is so contagious and dangerous for any business or unprepared human mind. In addition to that I was never one for allowing the competence levels of other salmon fishers (if a beat was even fished that day!) to dictate to me whether salmon were present or not. I recall my late colleague & mentor Willie Laird advising me that there was a period back in the 30's where salmon stocks on the Tay were running low and his most favourite word of all was 'cyclical'. The psychology of the salmon angler is the most fascinating thing of all to study as it's easy for a fisher's head to go down when they've not had success after a day or sometimes even an hour! I once recall picking up 2 salmon anglers who were sitting on the riverbank who said it was a complete waste of time as I approached them in the boat even though we'd caught 2 perfect long tailed 'sea licers' (which must have swum past them) in the pool directly upstream of where they were fishing to their absolute amazement. I could see their heads were down as I was approaching even though my guest and I were as high as kites! Staying positive in your head whether you're a ghillie or salmon angler is crucial for success and forgetting the dreadfully thought out 'Catch Stats' theme that has 'afflicted' this beautifully unpredictably sport which was always going to bite us all in the backside when 'Old Sam' decides to stay away longer, not be fished for or dare not show up on time! We can often be like sheep that are fairly easily lead and especially by the luxury of a 'convenient' negative thought. I'm also 100% convinced that wild Atlantic salmon can sense negativity which can spread like wild fire among anglers massively reducing the actual fishing effort unless its flames are quickly dowsed! Catching salmon is seldom easy and has never been a 'condition of let' although many seem to think that should be the case. Making a completely wild creature take an artificial fly or lure when it's not in the river to feed should tell you enough about why you should celebrate when a fish does cooperate! 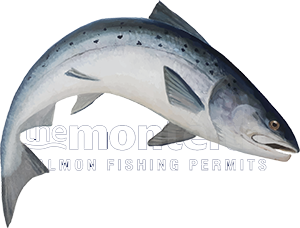 Understand the game you are playing as a fresh run salmon can easily sneak up on you at any moment during the fishing day and if your head isn't down (or your backside sitting on the grass riverbank!) then you've always a chance of catching it. I've seen this so many many times where the 'lucky' angler manufactured his own luck by keeping his fishing effort consistent throughout the entire fishing day and who placed galvanised steel between his head and the 'cup half empty' negativity brigade who were also present! Personally I think if it were far too easy to catch salmon it would diminish the accomplishment of doing so! In saying that it's been a national disgrace that this wonderful God given asset hasn't to date been better managed. A few old boys who know little about salmon who peaked commercially some 30 years prior in completely different industries advised by fishery managers who only want the 'easy route' to their pensions is never ever going to set the heather on fire! Scotland is well worthy of a team of precision thinking action men & women with proven track records in salmon stock regeneration to be 'set loose' on the attainable bigger picture where exact adult 'in river' salmon stock positions are known at any one time, where annual wild ranched smolt output targets are identified for each river system and achieved, where salmon ocean mortality is accepted as normal (and not as an excuse) and where much more consideration for the value of salmon fishing to the Scottish rural economy is 'genuinely' also figured into plans!